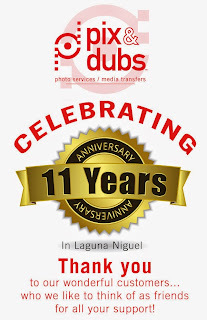 We are celebrating our 11 year in our Laguna Niguel Location. In a time where virtually all our competitors are literately gone and gone by the thousands... we have survived. The reason I think is our expert knowledge in the photo/media field along with excellent customer service and follow up. We have always striven for real solutions to the challenges the digital transformation has brought to all our lives. Like it or not- digitally speaking we live in a different world than just a few years ago. Thanks again to everyone for your support and believe in our people, products and the services we provide at Pix & Dubs/Coliday. Pix & Dubs is now a Carbonite Authorized Reseller. Recently, we’ve become an authorized reseller of Carbonite online backup. Now, you can purchase Carbonite’s automatic online backup service for your computer through Pix & Dubs. Subscribers in more than 100 countries rely on Carbonite to provide easy-to-use, affordable and secure cloud backup solutions with anytime, anywhere data access. The company has backed up more than 300 billion files, restored nearly 20 billion files, and currently backs up more than 350 files each day. Carbonite offers automatic, continual and secure online backup for your home or small business computers, so you can rest easy knowing your irreplaceable files are protected. Once installed, your files will be backed up automatically to the cloud – no hardware required - so you can get them back when you need them most. Not at your computer? No problem! You can get to your backed up files from any computer connected to the Internet or even from your smartphone or iPad® with Carbonite’s free app. And, with Carbonite’s Anytime, Anywhere Access, you can view your files anytime – whether you’re at home, or on the go! Click here to start protecting your files with Carbonite today! For more information on how you can start backing up the files on your home or small business computers, contact us today! Copyright © 2014 /Pix & Dubs. All rights reserved. of preserving and protecting your precious keep sakes and memories. Call, click or visit us today. Take action now before it's too late. you have captured in photographs, videos and audio tapes. Things that simply can't be replaced.